This post started out as a promise or to be more specific a desperate prayer. This past weekend I spent the day at Jones Beach (which was a lot of fun!) But despite being half Greek, my Irish half has given me very fair skin, skin which after we drove home from the ocean decided to let me know how much it didn’t like being out in the sun. At first I just turned lobster red, which was to be expected. I don’t tan I burn like a vampire “meeting the sun” with a death wish. Then the next day my entire face swelled, despite all the sun screen I had used, then the next day it swelled even more. And I mean SWELLED, I didn’t look like the same person. Kind of apropo while I’m writing about the destructive side of certain sun Goddesses, but still not fun. It’s also not the best thing that could have happened on July 4th when all the doctor’s offices are closed. So I desperately called every doctor I could find, only to find they were closed. Frustrated, swollen, and not happy, I was about to give up. I closed my eyes took a deep breathe and sent a silent plea to the Goddess. I took another deep breathe and decided to call one more doctor. I scrolled down on the screen and looked at the name. Dr. Fand. Well wasn’t that odd, a doctor named after a Irish Goddess. 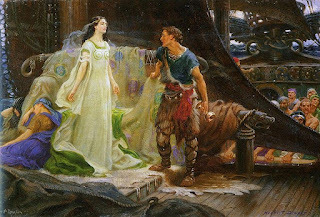 I immediately thought of the faery queen who took the hero Cuchulain as he lover. I silently sent a prayer out the Fand, if this doctor was open I’d write something about her and spend the week working with Her, letting myself be open to whatever it was she wished to teach me. It’s not every day you come across a doctor with the name of Goddess, or one that pronounces it the same way. At very least it was an odd coincidence, and I don’t believe in coincides. I dialed the doctor’s number, and a human being, not and answering machine, picked up on the other end. So as I have burn cream slathered on my face I have Fand on my mind. More to come on her soon, but for tonight I think it will suffice to light a candle and burn some incense as thanks.